In honour of Back to the Future Day tomorrow, Jonathan Tallant from our Department of Philosophy considers a key conundrum of Marty McFly’s adventures in time. I suspect that you know the story. Our hero, Marty McFly, is sent to the 1950s via the scientific shenanigans of his good friend Doc Brown. Whilst in the 1950s, Marty encounters his parents—as they were in the 1950s; young, passionate but, at least to start with, not all that interested in one other. It swiftly becomes apparent that Marty must ensure that they fail in love, else he will cease to exist. Hijinks ensue. But there’s a bit of a philosophical problem lurking. Marty exists in the 1950s, else he couldn’t meet his parents. The only way for Marty to get to the 1950s is for him to have travelled back from the 1980s. If Marty’s parents don’t meet and fall in love, then Marty won’t be born and so can’t have got to the 1950s. Yet there he is! And so it seems that Marty can’t fail to get his parents to fall in love. Now, maybe that sounds ok at first pass. Marty just can’t fail! Ok, so we’ve killed the suspense a little, but a good philosophical analysis can do that sometimes. But now let’s push this just a little bit further. Marty can’t fail. Really? Marty is a normal flesh and blood human being—at least according to the film. And people fail to do things all the time. Do we really want to say that Marty couldn’t have fallen for the advances of his 1950s mother? Do we really want to say that his attempts to bring his parents together (don’t worry, I won’t give away any spoilers) couldn’t have failed? If he’s just human, then the possibility of failure is surely there. So now things seem a bit strange. Marty could fail. He’s only human and, pushing the risk of spoilers, simply might not do a bang-up job of playing ‘Earth Angel’ (and he’ll need to). On the other hand, Marty can’t fail to play the tune well. If he did, he couldn’t have got there in the first place. He can and he can’t. What’s going on? One popular philosophical way of accounting for this particular kind of case is to suggest that the appearance of a contradiction here is due to an equivocation on the word ‘can’. Philosophers often worry that the ordinary language that we use isn’t sufficiently precise to capture all of the nuances that we might want to. In this particular case, there are two ‘cans’. The first can is a can of ability: given Marty’s character, what is he able to do? Well, he can succeed or he can fail. Both outcomes are consistent with Marty’s abilities. In contrast, there’s another ‘can’; the can of possibility. Given that Marty is there in 1950, there is no way that he can fail in his quest. What seems a bit of a puzzle turns out to be a matter of getting clear on a can-can distinction. 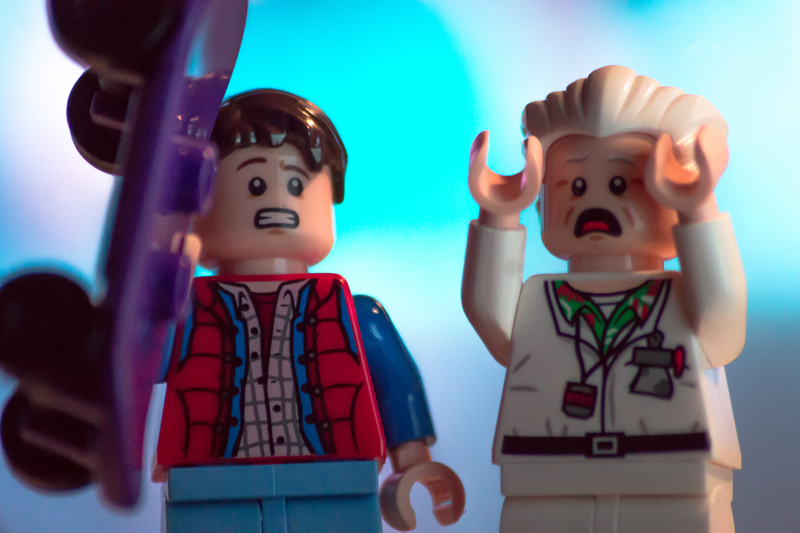 Image credit: Marty and Doc Lego via Chris Alcoran on Flickr. During the first movie, the photograph that youngest sibling Marty carries begins to fade. First the eldest sister disappears, then the middle brother. Finally, as it appears that his parents are disinterested in each other, Marty becomes transparent and begins to faint as his own image in the photo fades. Just a thought: the plot allows for him to fail to make a match of his parents, thereby costing him his existence. But… If he failed, then he wouldn’t exist, he would fade. He then would not be able to fall out of the tree and mess up his parent’s meeting, so he would effectively succeed by failing and not disrupting the timeline. However, if he succeeds then his personal existence continues past that point (in the past); if he fails then his own existence fails there and then and the entire time loop disappears only to reappear again as soon as his non-existence based non-travel resets the timeline. In fact I propose that we may actually be seeing a Groundhog Day cycle where he keeps returning, failing, disappearing, resetting, trying again (perhaps a different way) – UNTIL he succeeds. So I agree that he cannot fail – the only thing up for grabs is the manner in which he succeeds – and that has an impact in the future – good job he finally chose a route to success that made his future better… until Biff went back….